This February Half Term AFYA are running our popular netball (for 8-14yr olds) and rugby (for 8-13yr olds) camps at Cheadle Hulme School. 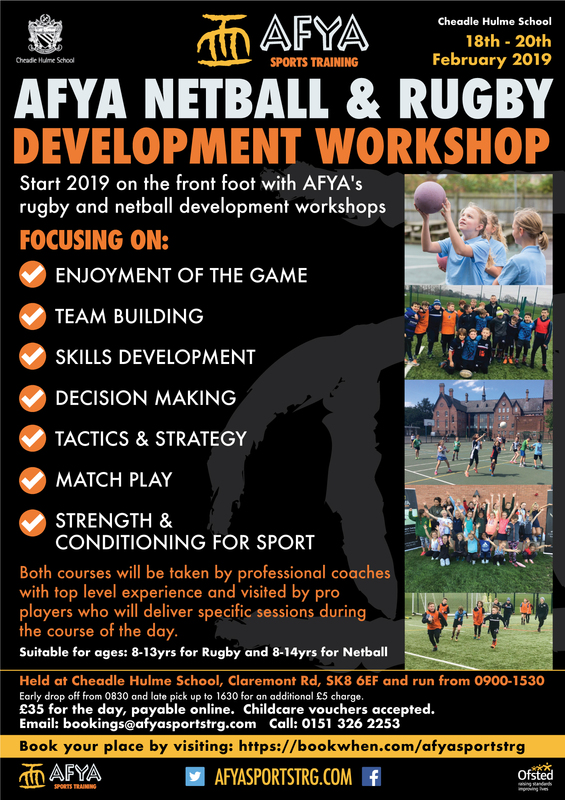 This is a fantastic opportunity to spend time developing your netball or rugby skills and be coached by top sports professionals. Both courses run from 18th-20th February, and attendees can be booked on individual days or the whole three days. £35 per day to be paid in advance via the AFYA booking system. Childcare vouchers accepted. To book your place click on the booking button below. Please direct any queries to bookings@afyasportstrg.com Or call 0151-326-2253 . © AFYA Sports Training 2018. Site by Brand Solutions.